Situated near the beach, this aparthotel is within 9 mi (15 km) of Archaeological Site of Thermi, Thermi Beach, and Monastery of Saint Raphael. Agios Stefanos Beach and Roman Aqueduct at Moria are also within 12 mi (20 km). Situated in Lesvos, this apartment building is in the same area as Monastery of Saint Raphael, Thermi Beach, and Archaeological Site of Thermi. Area attractions also include Agios Stefanos Beach. Situated near the airport, this hotel is within a 15-minute walk of Teriade Museum and Theophilos Museum. University of the Aegean and Church of Taxiarches are also within 2 mi (3 km). This Lesvos hotel is on the beach, 0.1 mi (0.1 km) from Skala Kallonis Beach, and within 6 mi (10 km) of Kalloni Salt Pans and Kalloni Salt Lake. Iera Moni Limonos and Museum of Industrial Olive Oil Production are also within 6 mi (10 km). How Much is a Hotel Room in Skala Neon Kidonion? Hotels in Skala Neon Kidonion start at $51 per night. Prices and availability subject to change. Additional terms may apply. So, you are traveling to Lesvos Island and looking to reserve a place to sleep around the Skala Neon Kidonion area? Travelocity's booking page at the moment lists 3 hotels in and around the city center. Enlightened visitors who want to find a place to sleep just a short walk from central Skala Neon Kidonion, will enjoy comparing the Erodios Hotel and Nitelli's Houses. Check out the Assos Behram Hotel - Special Class along with the Assos Barbarossa Hotel - Special Class. The Assos Behram Hotel - Special Class is just 18 miles (30 kilometers) outside of the middle of Skala Neon Kidonion. The Assos Barbarossa Hotel - Special Class, is positioned 18 miles (29 kilometers) away. 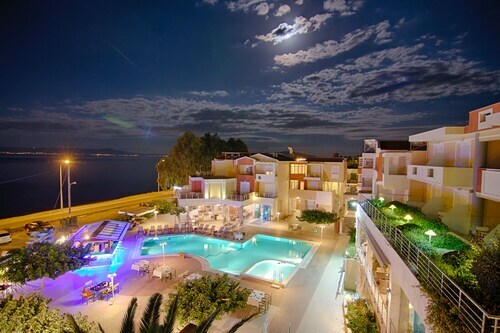 Another option is to book the Heliotrope Boutique and Resort Hotels or the Pyrgos. Positioned 16 miles (26 kilometers) northwest of Skala Neon Kidonion is Efthalou, which is home to a number of hotels. The Gaea Gardens Studios and Villas and Machi's Guest House are a few of the Travelocity-registered places to stay here. Mytilene International Airport is the major gateway for arriving by air to Skala Neon Kidonion. It is located 15 miles (24 kilometers) from the city center. For travelers who would find it convenient to find a Travelocity-listed base nearby, check out Heliotrope Boutique and Resort Hotels or Oikies Small Elegant Houses. Only complaint there was no continental breakfast whuch I was expecting as I received in the past.